is saying to you on this lovely day. Good morning beautiful and make me as soon as possible. I do believe this recipe is going to win you some applause my friends. 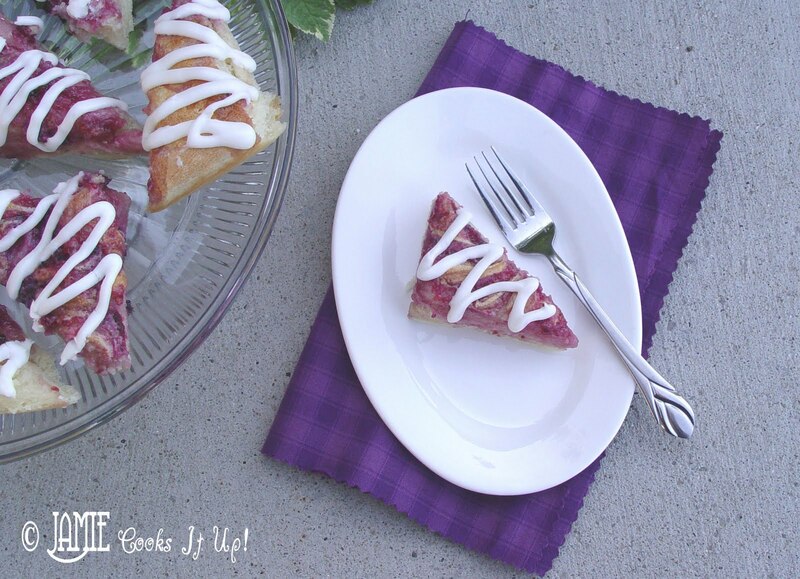 If you have tried making my Quick and Easy Breadsticks you are going to be sitting pretty with this Cream Cheese Danish. I am doing a guest post today over at 320 Sycamore. Quick and Easy Breadsticks are the recipe I am sharing with the readers there. 320 Sycamoreis actually a home decorating blog with great inspirational thoughts. You may want to check it out. The dough is the exact same for both recipes! I knew you would be thrilled. Super Dang Good, I say. 1. Mix the water sugar, sugar and yeast in the bottom of your Kitchen Aid, or mixing bowl. Let it sit for 5 minutes until nice and bubbly. 2. Add the salt and the flour 1 C at a time while mixing until the dough scrapes the edges of the bowl clean. When all of the flour is added mix on high for 5 minutes. 3. Pour the 2 T of butter into the bottom of a large jelly roll pan or cookie sheet. Spread it all around to cover the pan. Set the dough on the buttered pan and let it rest for 5 minutes. Don’t skip this step friends. Your dough will be hard to handle unless it rests. 4. Press the dough out to the corners of the pan. 1. In a small mixing bowl mix the softened cream cheese, sugar, vanilla, egg and salt together. Mix on high for about 2 minutes or until all ingredients are smoothly incorporated. 2. Spoon the cream cheese filling onto the dough and spread it around to cover the dough with a knife. 3. Warm your jam up in the microwave for about 30 seconds. This will make it easier to spread. Spoon it onto the cream cheese filling in little globs. 4. 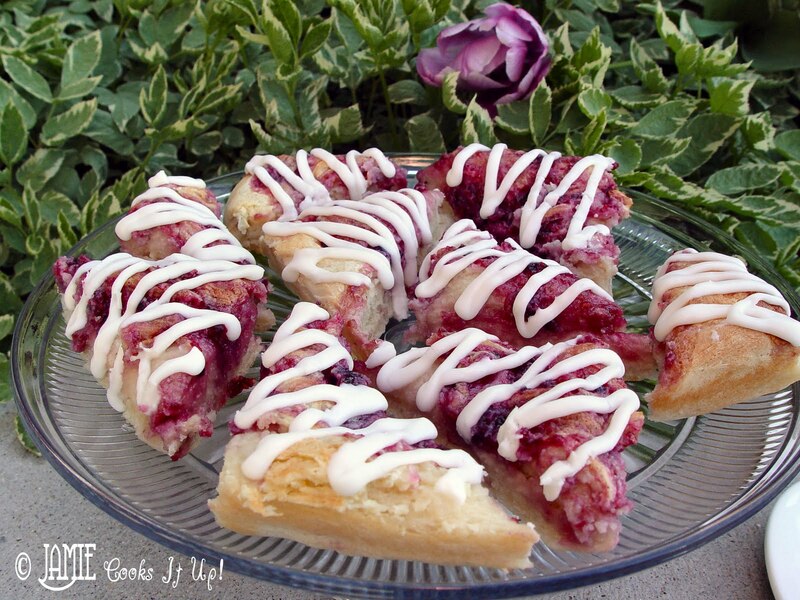 Run a knife or spoon through the cream cheese filling and jam to make a marble like pattern. 5. With a pizza cutter cut the dough into 12 large (5 inches or so) squares. Then cut each square in half diagonally to make 24 triangles. 6. Let the dough rest and rise for about 10 minutes. You don’t want it to rise very much. It should only rise up to be even with the rim of the pan. 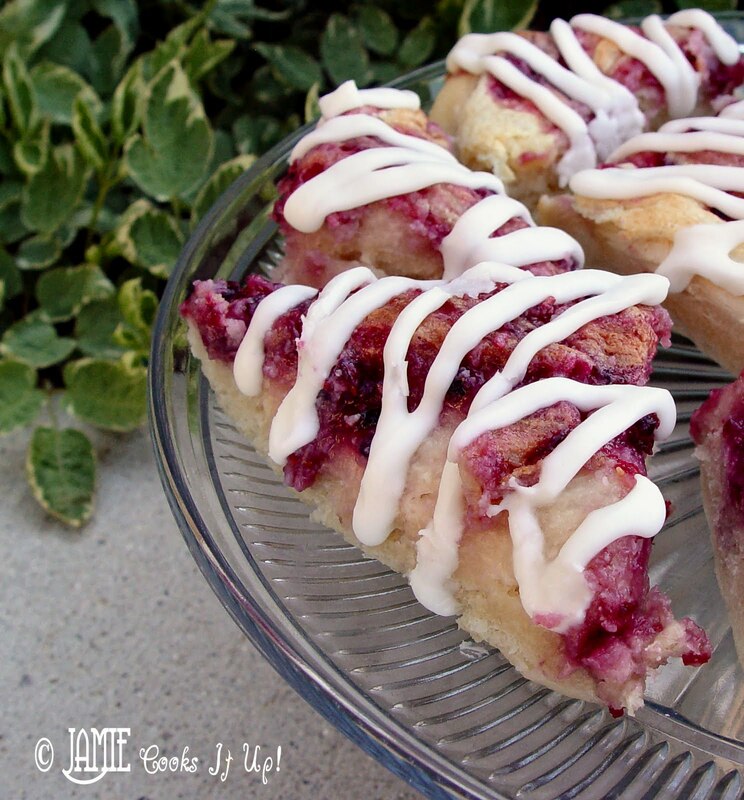 Just watch it carefully then bake it when it reaches the rim of the jelly roll pan. Bake at 350 for about 20 minutes, or until the top and the bottom both get golden brown. When they are done take out of the oven and let cool for 10 minutes. 7. Run your pizza wheel back through the cutting lines you cut before baking. It will be kind of sticky and gooey. Clean off your pizza wheel several times as you go. 1. In a small bowl whisk together the ingredients for the glaze until smooth and silky. Put into a Ziploc bag and cut a very small opening in the corner. After the danish is mostly cool separate the danishes from each other and remove from the pan, pipe the glaze onto the danish and serve! 3. Pour the 2 T of butter into the bottom of a large jelly roll pan or cookie sheet. Spread it all around to cover the pan. Set the dough on the buttered pan and let it rest for 5 minutes. Don't skip this step friends. Your dough will be hard to handle unless it rests. 6. Let the dough rest and rise for about 10 minutes. You don't want it to rise very much. It should only rise up to be even with the rim of the pan. Just watch it carefully then bake it when it reaches the rim of the jelly roll pan. Bake at 350 for about 20 minutes, or until the top and the bottom both get golden brown. When they are done take out of the oven and let cool for 10 minutes. OH MY WORD!!!!!!!!!! Wow. I'm so glad this is homemade instead of store-bought crescent dough. I must make this pronto. I love the process photos! I love the swirl and icing! WOW! these look great. I just found your blog and drooled all over myself. lol I am a new follower and look forward to trying some of your yummy looking recipes. Thanks to Barb at dogmom diva I am loving it over here! I hope you will join me soon! Oh wow! Do these keep well overnight? I like to send things with The Hubble to work in the mornings but don't like to get up way early (3am) to make things. This would probably blow their socks off…if it keeps well overnight that is. Either way I'll probably be making these soon. Thanks for sharing! I have never tried freezing them, but my thoughts are if you made them the night before they would still be pretty darn good in the morning. I sent them in my kids lunches and they said they were still good. If you put them in the freezer I would suggest heating them up in the microwave just a bit after they were thawed. Let me know if you try it! Yum! This sounds delicious Jamie, I'll be trying it soon. I just found this post and that danish looks incredible.I work in a bakery and all the cheese filled products never have enough cheese filling in them. I was wondering about only one 8oz pkg. in this recipe. Does it taste really cheesy? Would it mess it up to ad, say, another 4oz. of cream cheese?? The cheese filling isn't super overpowering. You could try adding another 4 oz…however, I get a bit worried that it won't set up and cook quickly enough resulting in the DOUGH being over cooked. Those are just my thoughts. Let me know if you try it and how it goes! I made this last Thursday and took it on a 5 hour car ride on Friday and we had it for breakfast on Saturday and my dad said it was far better than the $18 one that he bought in a grocery store. It keeps really good and we just heated it up for 20 seconds in the micro. Very delicious and will be making it lots more!!! Woo-Hoo! I'm so glad they turned out so well for you. Thanks for letting me know. That's super great! I think I'm in love with those swirls. Jamie…this looks amazing and I can't wait to try it on my family! Thanks for your amazing photos and step process! Feel free to view my new food blog…I don't have as many amazing photos, but yummy recipes! I can't wait to try this!! With a homemade dough!! You rock!!!!! I am your newest follower! You can bet I will be featuring some of these recipes as I try them out over on my blog!! Thanks!! I sang with joy with my first bite! Oh my YUMMY! This amazing danish will be a staple of my family cookbook. Thank you so much for sharing! Any chance you can give advice on making apple or blueberry danish? Without cream cheese preferably? How do I prepare the fruit? Thanks so much for your time! The best way to add fruit to this recipe, is to use either blueberry jam, or blueberry or apple pie filling. You can easily just omit the cream cheese. Good luck. I'd love to hear how it turns out.